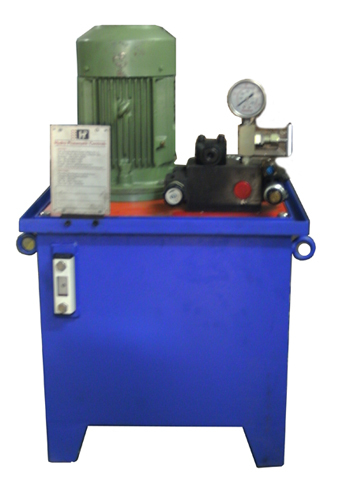 Hydraulic Power Pack manufactured by us consists of a Oil Tank. 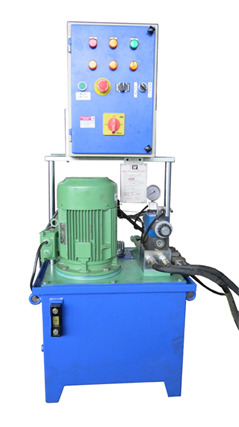 whose base frame carries a vertical or horizontal flange mounted & Electrical Motor couple through a Gear coupling to Vane pump, Gear pump or a Piston Pump, depending upon pressure and capacity. 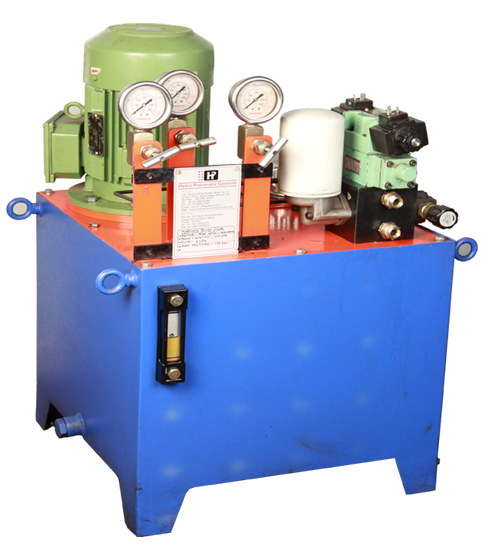 The suction side of the pump is fitted with a Suction strainer capable of straining particles of Micron size while the discharge side of pump is connected to a Manifold Block. On the various faces of the Manifold Block directional control valves are mounted. The control valves are suitably inter- connected in the Manifold block though drill passages to eliminate inter connecting piping. Thus achieving compaction reduces noise level, easy accessibility for maintenance by just removing the bolts. Oil level in the tank is displayed by oil level indicator with temperature control gauge which is fitted in the front of the tank at topside. The drainage system is given on the side of the tank at the bottom. For filling oil in the tank Air Breather is provided at the cover plate. Return line filter is fitted behind the Mani fold block to purify the used oil & return to the tank. The critical High Pressure pump Valves, and other Hydraulic elements used are from the well known BOSCH-REXROTH, VICKERS, YUKEN, AUTOS, SUFFON, POLYHYDRON, HYDROLINE and STUFF from India and worldwide company's. The Electrical switch gear components used are also from the market leaders such as SIEMENS or L & T only. 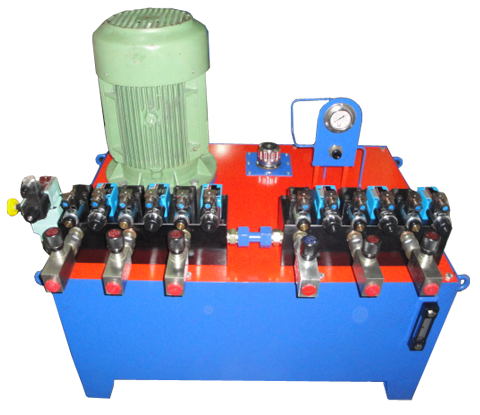 We manufacture Hydraulic Presses, Hydraulic paper cutting Machines, Hydraulic Rubber Molding presses etc, We also design systems based on customer requirement. We manufacture Hydraulic Cylinders to all types of Earth moving machineries specially Dozers, Front End Loaders, Backhoes, Tippers, Dumpers, and Garbage handling machines. Sugar cane cutting machineries Bore well machines, Rock drill machines etc. We have supplied thousands of Hydraulic Cylinders all over India and abroad to Earthmoving equipments manufacturers. We have developed sound goodwill to cater requirements of O.E's & consumers in industry: Textile, Boilers, Sugar, Pharmaceuticals, Chemicals Engineering Projects, and Welding & Plastics etc. We are also in business with public sectors , Railways, Thermal power station retainers & Steel Plants etc. We keep regular stock of Hydraulic components such as Hydro Motors, Valves, Pumps, Level indicators, Breathers, Gear Couplings, Bell Housing, Mounting Brackets, Pneumatic Accessories, Pressure gauges, Hose pipes, Filters, Strainers, Seals, Tanks Bucket teeth's, Swill Bearings, Harden Bushes, Hard chrome plated Rods and Honed Tubes etc. We keep some particular items duly imported like Seals, Honed Tubes, Bearings and mobile valves.